The company Frescamar Alimentación was invited -along with the rest of winners of the award “Alimentos de España 2016”- to participate at the Salón de Gourmets recently held in Madrid. And the best way to show the attendees how much this recognition is deserved was to offer a tasting of its leading product: Corvina REX Frescamar. 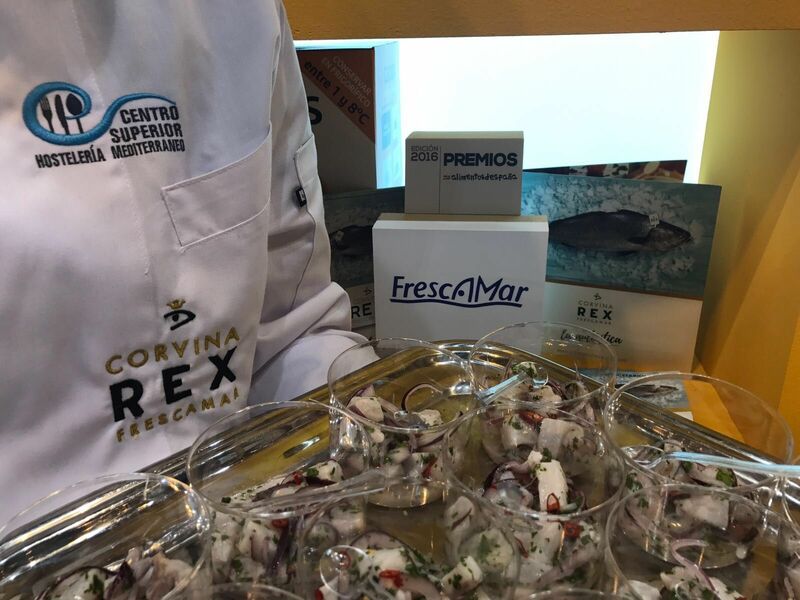 Two students from the Centro Superior de Hostelería de Madrid, Sofía Benavides and Unai Baquerín, were in charge of preparing a refreshing and tasty corvina ceviche to treat everyone who came by the Ministerio de Agricultura y Pesca, Alimentación y Medio Ambiente stand. Two hundred servings were prepared on the spot and they “vanished” in the blink of an eye among the audience of the event. Guests could not stop praising the product and the innovative preparation. Additionally, Frescamar handed out recipe books where, besides ceviche, other appealing recipes starred by Corvina REX can be found.